With this Italian-made Michael Kors MK3131 Chronograph Twist watch Michael Kors has created a watch that combines quality with style and craftsmanship. 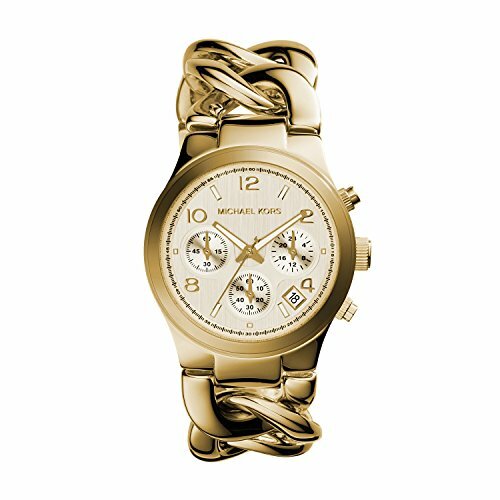 This classic Michael Kors analog chronograph watch for women features a gold-toned stainless steel case (38mm diameter and 14mm thickness) and unique twisted band (21mm width) making this piece something unique and fun. This watch features luminous gold toned dial hands and alternating Arabic numeral and indexed hour markers against a creamy white dial face. Under the scratch-resistant mineral dial window lies the watches analog display complimented by 3 sub-dials (seconds minutes hours) and date display. This piece is water resistant up to 50 meters. This item comes with a box and designer's documentation.